Tired of the same old, boring laminated pattern that's in all of your 3D printed stuff? Industrial design student Vimal Patel was, and so he decided to fashion himself a 3D doodler, out of a hot glue gun which he modded with a custom Lego extruder. You know, obviously. According to Patel's website, the idea began with a university project where he was asked to design something using biodegradable, 3D filament. The goal was to explore monomateriality, or making products with a single material—a concept that's grown in popularity since the advent of 3D printing. While a typical multimaterial consumer product may contain foam, plastic, adhesive and half a dozen more materials, all shipped from different parts of the world, products composed of a single material cost less carbon to produce and are far easier to recycle. It was clear that the layer-by-layer deposition of material constrained the plane of flexibility to a single axis which made it difficult to make complex shapes (like a helmet). The ideal situation would be to extrude material along a path in multiple axes (i.e., with a robotic arm). This is a damned difficult thing to model and program, so I sought a simpler way. 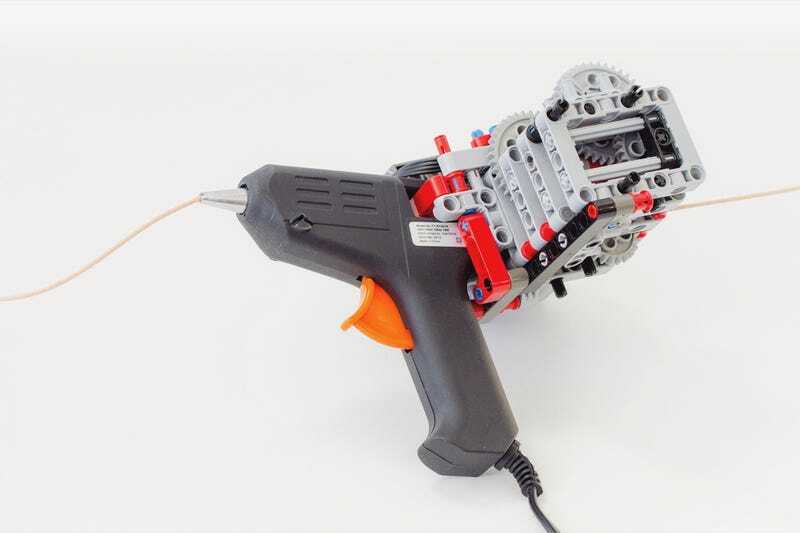 So, he ditched the printer entirely, and used Lego parts to build a custom attachment that would feed 3mm biodegradable filament through the nozzle of a hot glue gun. The product he ended up designing—a helmet that looks a bit like a bird's nest—isn't very realistic, but Patel is more excited by possibilities his new tool offers. To get other would-be 3D doodlers started, he made a digital file of the Lego extruder that's free to download so that anyone can replicate it. Top image via Vimal Patel.